Photograph of Boston Mayor Kevin White and unidentified women outside The Mobile Market taken for the publication The Older American, 1975. Massachusetts Association of Older American records, University Archives and Special Collections. University Archives & Special Collections in the Joseph P. Healey Library at the University of Massachusetts Boston is pleased to announce that the records of the Massachusetts Association of Older Americans have been re-processed to be more accessible for research. The Massachusetts Association of Older Americans (MAOA) was founded in 1969 by Frank Manning as a non-profit advocacy agency. The organization works to ensure a dignified life for older people by striving for adequate income, affordable housing, and accessible, quality health care. The statewide membership is comprised of individuals working to keep older people in the mainstream, increase public awareness about aging issues, and build a strong network for elder advocacy in the Commonwealth. An early Faneuil Hall rally organized by MAOA drew more than 1,000 elders to fight for reduced Massachusetts Bay Transportation Authority (MBTA) fares. In 1971, MAOA (then called the Massachusetts Legislative Council for Older Americans) gathered 14,000 seniors and supporters at Suffolk Downs to rally for elder issues. Speakers included Frank Manning, Massachusetts House Speaker David Bartley, United States Senator Edward Brooke, and Boston Mayor Kevin White. 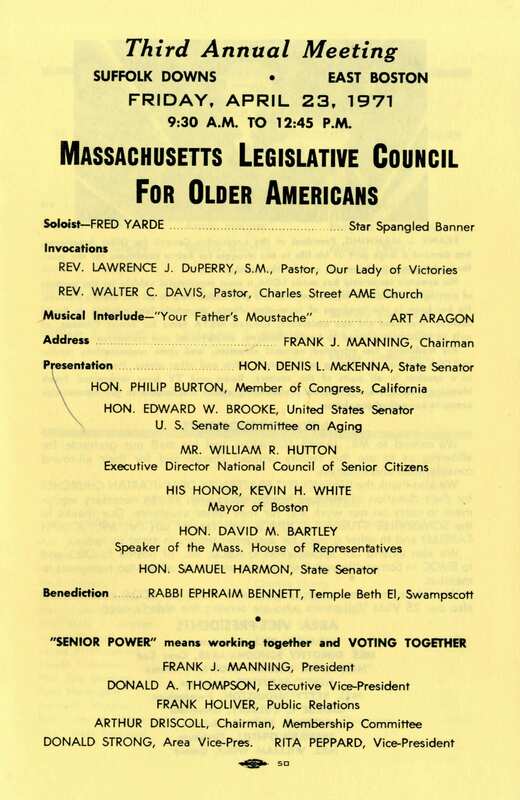 Cover of program book for Third Annual Meeting of the Massachusetts Legislative Council for Older Americans, held on April 23, 1971, at Suffolk Downs in East Boston. The event and rally was attended by around 14,000 people and included remarks by a number of local and national public officials. 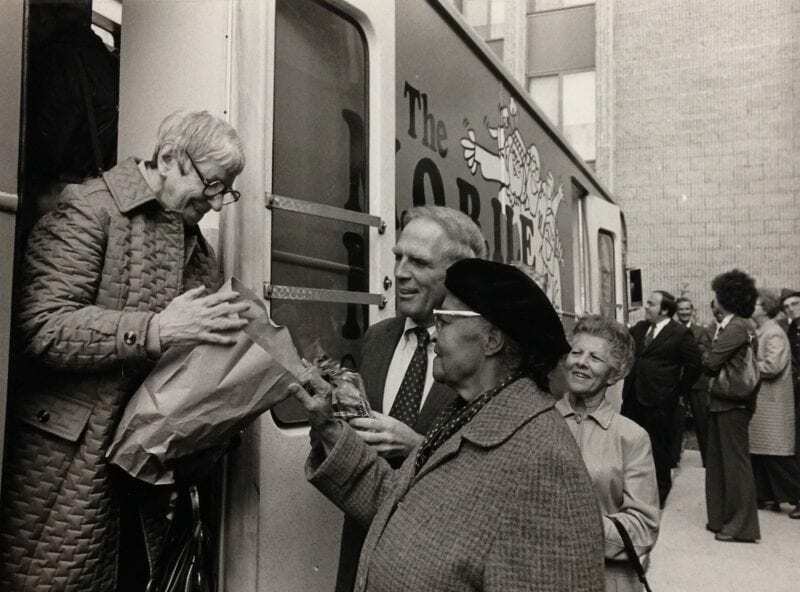 MAOA’s advocacy efforts led to the creation of the Massachusetts Executive Office of Elder Affairs in 1971, which was one of the first cabinet-level senior agencies in the nation. MAOA is also responsible for helping to end mandatory retirement at age 65. MAOA continues to advocate for increased funding for home care, nutrition, and fuel assistance, and some of MAOA’s current programs include mental health programs, elder advocacy training for interested groups throughout the state, and SeniorNet, which provides computer training. MAOA collaborates with the UMass Boston Gerontology graduate programs and a number of other groups, such as Boston Partnership of Older Adults, Mature Workers coalition, Senior Actualization and Growth Expectations-Boston Collaborative, Senior Housing Coalition, the Senior Pharmacy Coalition, Action for Boston Community Development, Massachusetts Home Care, and the Massachusetts Councils on Aging and Senior Centers. The re-processed collection includes organizational files, membership lists, board meeting minutes and agendas, correspondence, and the organization’s by-laws. The collection also includes files related to the Legislative Council of Older Americans and materials used as part of the organization’s advocacy efforts and research. A run from 1975 to 2000 of the MAOA’s quarterly newsletter, The Older American, is available as part of Series IV in the re-processed collection. View the finding aid for the records of the Massachusetts Association of Older Americans here. This entry was posted in Announcements, Collections, Special Collections and tagged elder services, finding aids, gerontology, Legislative Council of Older Americans, Massachusetts Association of Older Americans, special collections. Bookmark the permalink.